Jennifer was very instrumental to the success of the Capital City Salsa Festival. Her dedication and thoroughness contributed to the success of the festival. She always goes above and beyond the scope of her responsibilities. Jennifer was also the primary instructor for the CCSF’s Beginners Bootcamp. She spent numerous hours teaching beginner dancers all day, Saturday and Sunday. Her approach to instruction was more than excellent. Whether the students have little to no experience in dance, she makes sure they feel welcomed, challenged, and entertained. The students raved about her instruction style throughout the festival weekend. There were so many compliments that I, the director of the festival, had to witness it myself! One that can influence a student to learn and excel in their dancing abilities makes a great instructor. Her hard work, good heart, and knowledge make her a very reputable dancer/instructor in the community! The by far best choice I could have made was to ask Jennifer Benavidez to host our Gala Night on Saturday at the Salsa Convention Berlin 2013.With her charm and sense of humour she conquered the hearts of the audience within minutes. On top of that she is an absolute eyecatcher! If you need a professional MC to guide your guests through the night – book this talented Lady! 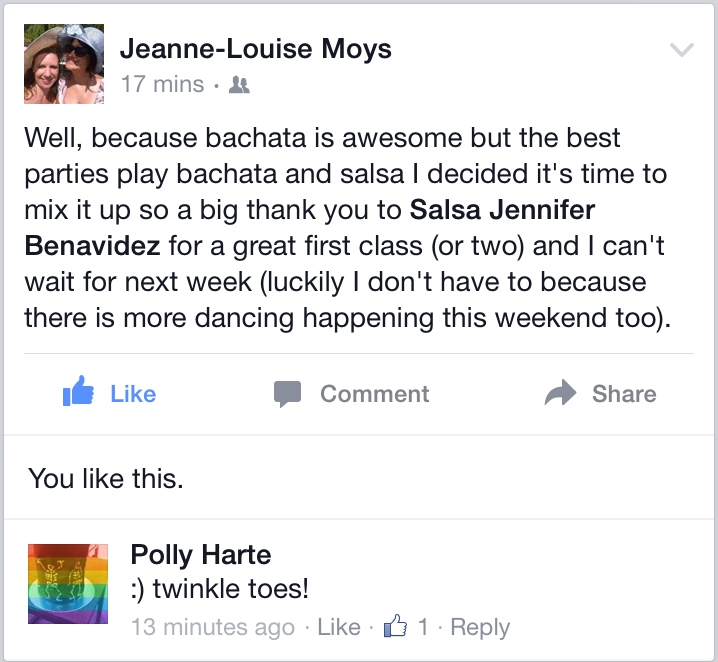 I took a 2-day beginner class with Jennifer at a salsa conference in Texas. She was stuck with an extremely diverse group in terms of age, experience, and a large male/female imbalance. She still managed to keep the lessons well organized, and more important, fun for everyone. By the end, absolute beginners were executing a whole series of moves, and many people couldn’t wait to find a local studio to continue with more lessons. Her class was a great experience which reminded me how much fun dancing can be and what a great way it is to get to know new people. 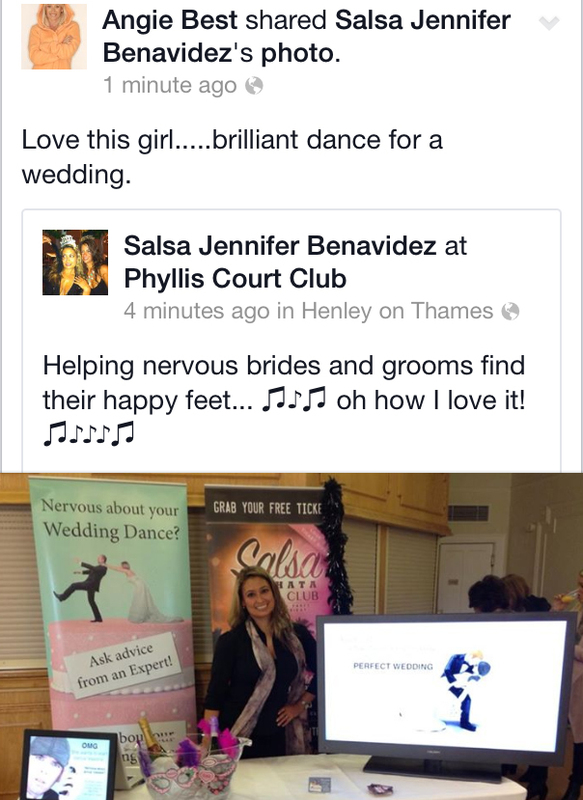 For several years I followed the salsa classes of Jennifer ‘Salsa’ Benavidez. 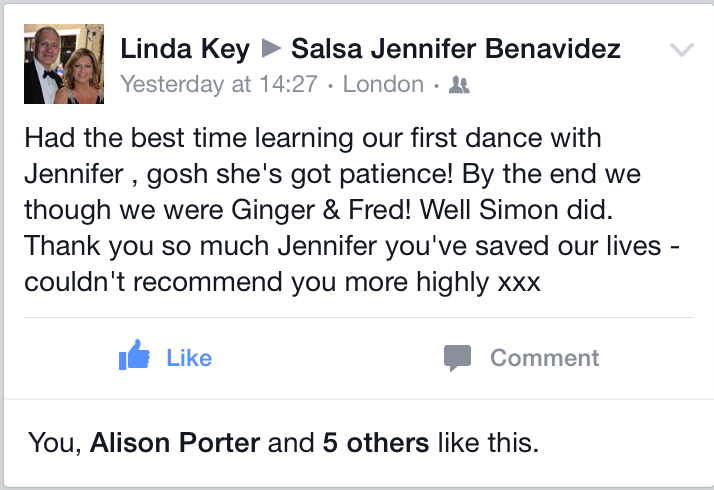 Salsa classes from Jennifer are Fun and Energetic. 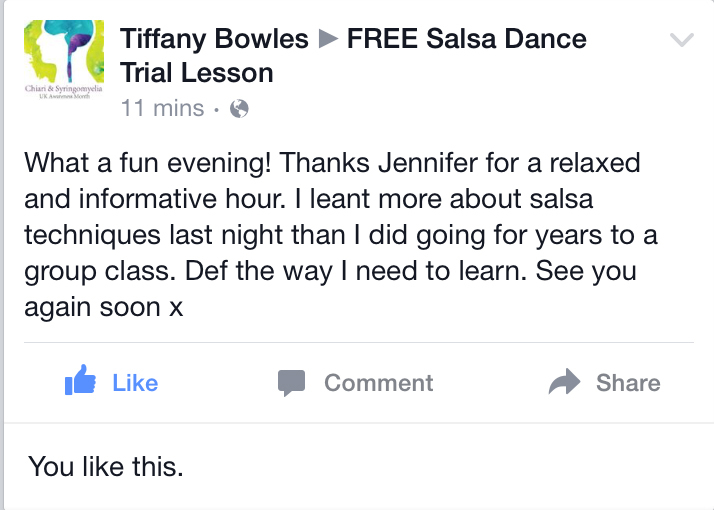 She is a great teacher and has a catchy enthusiasm that gets everybody to have fun and make great progress at learning salsa. Awesome classes! Jennifer’s friendly and energetic attitude makes her different from all other choreographers and teachers I have danced with! She has a specific and lovely teaching style that makes learning the movements so much fun and memorable! Jennifer’s experience and knowledge of several styles of dance combined with her unique approach make her a brilliant teacher to work with. After 7 years of dancing, Jennifer has given me a completely different viewpoint of salsa, because of her I have found a whole new confidence in myself both on the dance floor and the stage. I have taken great pleasure in performing alongside her on many occasions and she is always encouraging me and our show team to be the best we can be. Her positive attitude has pushed me to try things I would have otherwise not believed I could do, her approach on development and growth has driven me to use what I have learnt from her to find my own style. She is a brilliant teacher and an inspiration to me! I have just spent 3 months on a ladies styling performance course with Jennifer. I have to say it was the most enjoyable experience for me, I learnt so much in a little time. 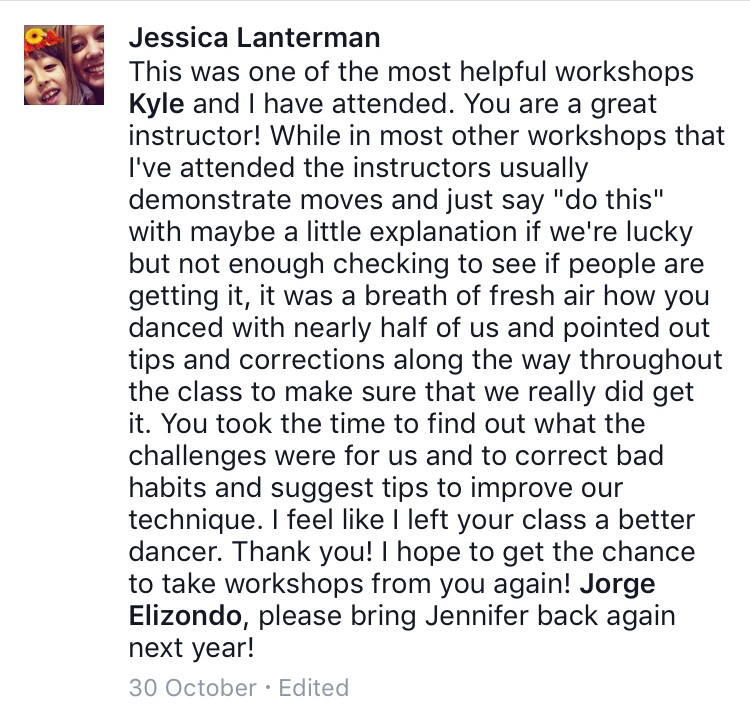 Jennifer’s experience and knowledge really resonates through her hot choreography and teaching style. She challenges herself as well as her students to pull out the best she can. I felt comfortable and inspired in her company to be able to work to my fullest potential. …open to ideas & creativity. Jennifer is an inspiration to work with! I think her style is unique and beautiful to watch and I’m honoured to have had the chance to work with her. Being apart of her performance group gave me the chance to soak up as much of her style as I could & I look forward to more rehearsals & performances with new material. She is a fun, energetic teacher, who is open to ideas & creativity. Lovely to work for & with! Thank you so much for the dance last night. I’ve been waiting 6 years for that! I took one of my first dance lessons with you years ago. Now I have 3 dance teams of 53 members. I’m traveling and teaching around the country. I organize one of the best latin dance events in Texas. THANK YOU for being an inspiration! I hope I get to visit overseas one day and see you in your new part of the world. You are truly amazing! 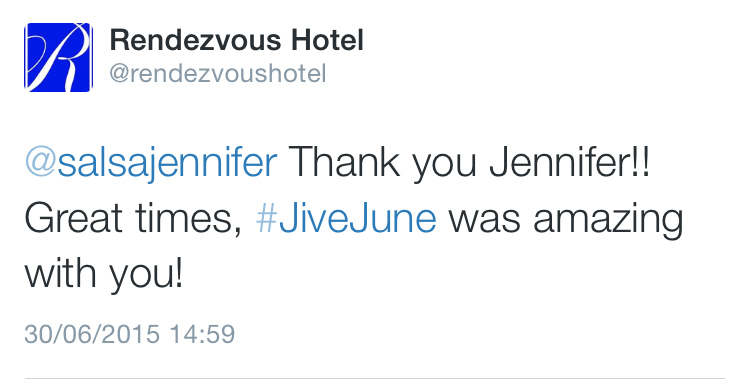 We met Jennifer when she was a guest dance instructor at our resort in St Lucia in June (Jive June). Whilst we hadn’t gone with the intention of learning to dance we decided to give it a try. Jennifer’s teaching style is relaxed and fun, breaking each move down slowly and working with the whole group. Her enthusiasm and energy is infectious even in 30 degree sunshine and we had a great time. In fact so much so that we made a point of dragging ourselves off the beach to go to every class over the 2 weeks we were there! I (Laura) am deaf and as soon as I told Jennifer this she immediately adjusted the class to ensure I could lip read her. She then remembered this for every class (something many instructors forget) without having to be reminded. Thank you Jennifer – you made our honeymoon even more fun and made sure that we didn’t look like complete fools on the dance floor. You even proved that you can dance with two left feet!! …great asset to any company. I have worked with Jennifer Benavidez several times and the last time we worked together was for our very popular themed month called ‘Jive June’. This is a month all about dance and educating our guests on several forms of dancing. Jennifer was an integral part of this themed month and took over our Latin section and Zumba. She had great interaction with our guests; fun yet professional. She also helped several employees in choreographing dance routines so that they could perform in front of our guests; this was very successful. In fact, I enjoyed her working with me so much that I’ve invited her back as a guest presenter for another themed period. Jennifer would be a great asset to any company. …she managed to convert him to dancing! On a recent holiday in St. Lucia at Le Sport we were lucky enough to find Jennifer teaching dance classes at the resort! The classes were brilliant! We had such fun and managed to learn a remarkable amount about various different dance styles. Jennifer is a wonderful dancer and such a delightful teacher. My husband and I had a private dance class with her, and she managed to convert him to dancing! What a joy to see him foxtrotting around the studio with a smile on his face! Thank you, Jennifer! We have been practicing and thinking of you! Salsa & Merengue dance lessons and ‘biertjes’ and ‘horloges’ are a secret combination of a fun workshop! 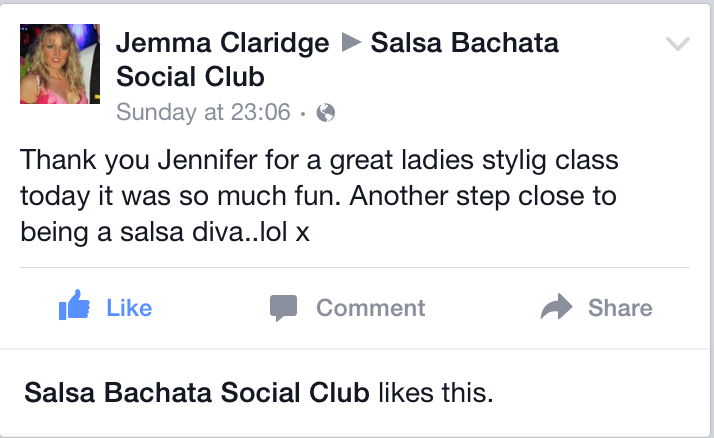 Thanks for my very first lesson of Salsa & Merengue dance. 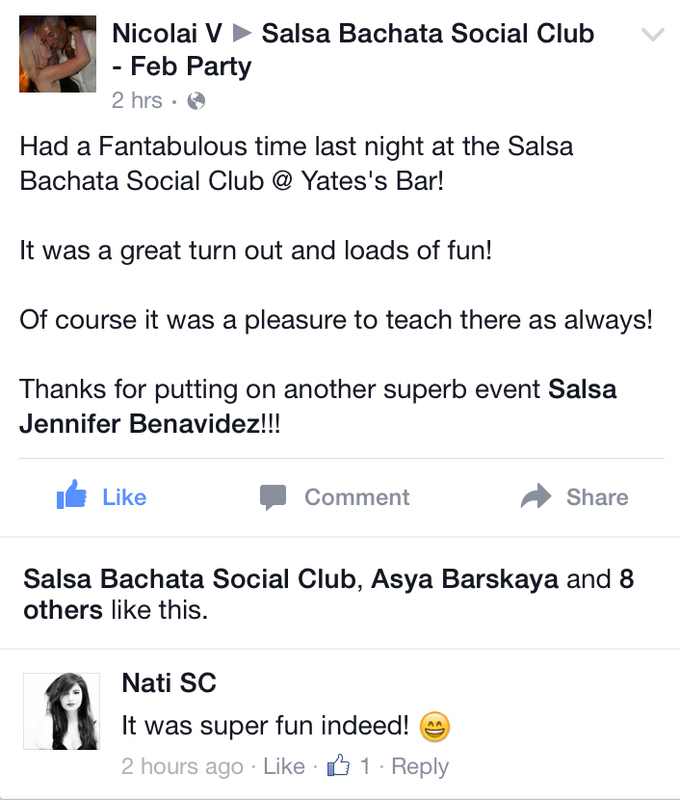 We all thank you for the super salsa workshop, everybody enjoyed very much. Today everybody is talking about the salsa and of course everybody is talking about YOU, Jen!!! haha! You were great and you had so much patience with a lot of us haha! Not to forget how beautiful you are and we are not going to talk about the hips !!! Thanks again and I am sure we will see each other again. Good luck with everything you do y hasta la vista! Everybody is still talking about it! We would like to tell you that we had lots of fun during the workshop and everybody was very enthusiastic. 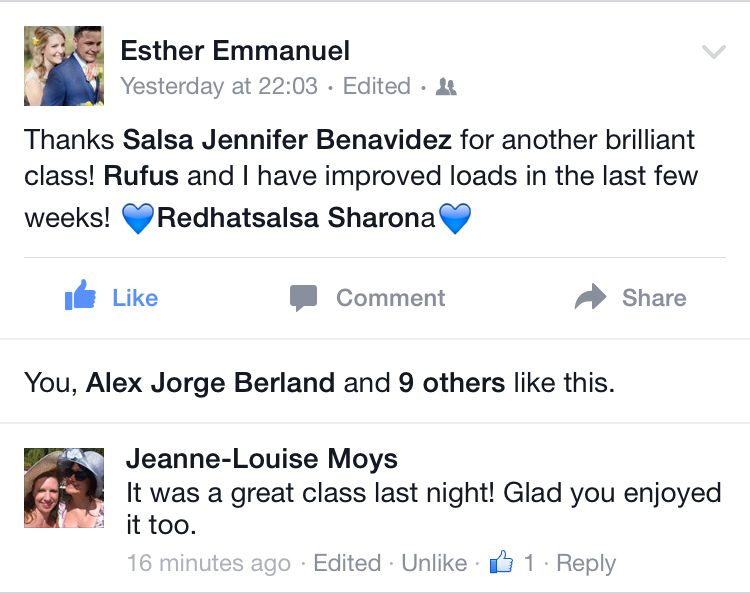 You were very enthusiastic as a teacher and managed to get everyone on the dance floor (above expectation)! Overall it was a really nice evening. Everybody is still talking about it! 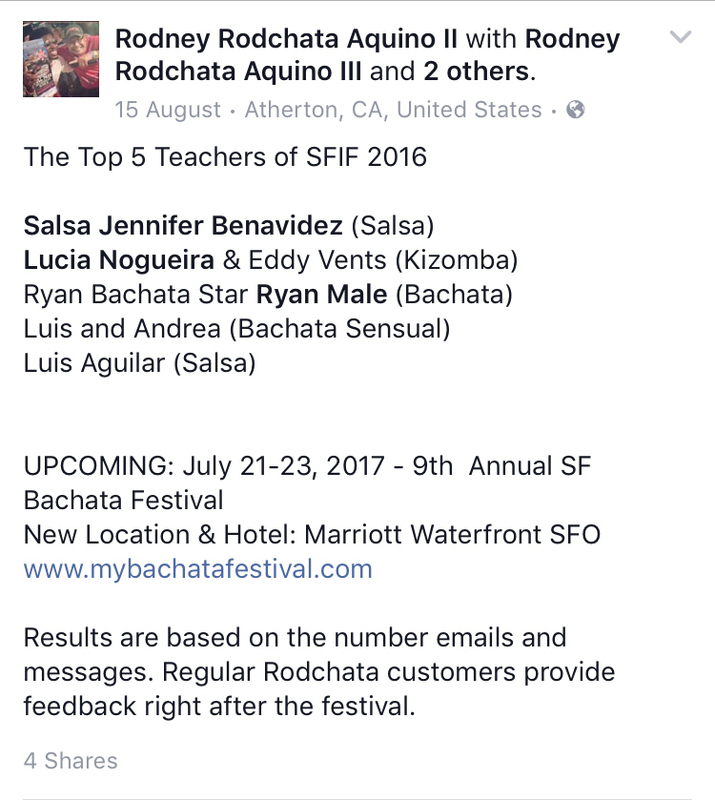 I was honored and excited to have Salsa Jennifer bring her Salsa Spin Technique for Lead & Follows to my 2016 Dallas Bachata Fusion Festival. Jennifer instills a love and appreciation for dance. She shares a positive, supportive atmosphere for students to learn the foundations, then builds on them with each step and turn. Thank you for bringing a such a positive learning environment and technique building workshop to my festival.